Much has been written about income inequality in American and how it’s hurting our country. We’ve heard all the examples where the CEO makes 800 times more than their minimum wage employees. Despite the inappropriate use of two extremes to form an opinion, it’s hammered home, time and time again, as an illustration of income inequality in America. Yet, despite the constant concern and identification of this inequality, the body politic doesn’t seem to have ideas on how to fix it, at least none that they are willing to say publicly. The populist cry of “tax the rich” seems to be the leader in the clubhouse, but we never hear exactly how that would work in practice. How much can we actually raise from the “rich”? How will the extra taxes be spent? What will be the consequences of higher taxation on economic growth? (Hint: it’s not good) Will the tax revenues be used to provide more assistance to the poor? Will it be used to pay our government workers more, even though they are already better paid than their peers in the private sector? Will it get funneled back to government friendly unions and corporations like Solyndra? How exactly will higher taxes solve the income inequality problem? Politicians who are unable to conjure up relevant or rational solutions to the huge problems we face today are left trying to save their own jobs by scoring easy political points with populist “tax the rich” rhetoric. Could the rich pay more in tax? Sure, but it’s folly to suggest “tax the rich” is the golden ticket out of our mess. If redistribution of wealth, via the all-knowing government, is the way to go, when do we stop? What’s the right amount of income gap? What's the right amount of taxation? How do we know who doesn’t make enough, and who makes too much? How do we compensate different levels of knowledge, effort and experience required to fill one job vs. another? What's the right amount of reward for indifference and ineptitude and what’s the right penalty for success and hard work? · An individual who couldn’t be bothered to show up for or finish high school, spends $2,000 a year on cigarettes, gets hammered three times a week and stumbles between different minimum wage jobs because they are either too hungover or too lazy to report to work on time, if at all. · An individual who worked hard for good grades in high school, qualifying them for enrollment into a quality university, paid for with a combination of student loans, a work-study program during school, and a full time job during the summer. After four years of good grades achieved through hard work and dedication, they get hired by a successful company where they deliver valuable results, again through hard work and dedication, including but not limited to extensive travel away from home and family, 60-80 hour work weeks, and numerous missed weekends and holidays. After 20 years, all of that hard work culminates with a dream promotion to CEO and a salary of $1 million per year. Should they make the same amount of money? Should the CEO pay for the slacker’s nicotine habit, 60” HD flat screen TV and HBO subscription through higher taxes? Is this an extreme example? Of course, but our use of two extremes illustrates our point, while highlighting the absurdity of the public debate on the issue. For us the only solution is a robust and free economy that promotes and rewards hard work and innovation. Only a robust private sector economy can provide full employment. America is the Land of Opportunity where everyone, regardless of class, color or creed, can make their own success through hard work and dedication. America is not the Land of Entitlement. Attempting to solve any income inequality problem by blindly taking from Peter in order to blindly provide Paul with benefits is not a sustainable model. The President and Congressional Democrats are doing an incredible job of making a mountain out of a mole hill in the debate surrounding the most recent payroll tax “cut” debate. The White House spin machine is at max capacity, resorting to flooding Twitter with the question of what $40 per paycheck means to everyone (i.e. the $40 extra a working family making $50,000 will see in their paycheck every other week if the tax “cut” is passed). The sob stories came flooding in showing that it would pay for bowling with an autistic godson or co-pays on diabetes prescriptions. Remember, the Administration is only using this rhetoric to push for a 60 day extension to a temporary tax "cut", not fundamental tax reform or any other policy of substance. It's a shameful political game and an incredible illustration of the desperate pandering to the electorate by the current White House. We won’t recount the reasons why a temporary tax holiday is ineffective - John Taylor does a better job than we ever could in today’s Wall Street Journal. It won't suprise anyone that temporary tax cuts or rebates only serve to inflate the deficit while providing little to no substantive or sustained economic benefit. The one-time tax rebate of 2001, the temporary tax cut of 2008, the cash-for-clunkers and stimulus payments of 2009 are Exhibits A, B, C and D, respectively. While the debate rages on about whether there will be an extra $40 in the average family’s first 2012 paycheck, the silence has been deafening on the effects of this “cut” on future generations. We’d like to once again remind everyone what the payroll tax is meant to pay for – future Social Security and Medicare benefits. Given the Madoffian nature of our Social Security and Medicare programs, the payroll taxes of today’s working families are used to pay the benefits promised to yesterday’s working families, regardless of how much they contributed. Therefore, the less we put into the system today, the more we’re going to have to take from taxpayers in the future. Let’s assume the payroll tax gets extended another year (despite all the political grandstanding, does anyone think Congress has the intestinal fortitude to actually keep the tax cut temporary?). Each family now has an average of $2,000 more in their pocket instead of in their Social Security or Medicare trust fund. Yea! We can buy that 60” flat screen we’ve always wanted!! However, if you think about the long term ramifications of this tax “cut”, you might think twice about that TV. A $4,000 cut today (i.e. two years at $2,000 each) has a future value (using a conservative 5% growth rate) of roughly $10,000 in 20 years, $17,000 in 30 years, $28,000 in 40 years or $46,000 in 50 years time. Let’s make a giant leap of faith and assume that these programs are not the largest Ponzi schemes on the planet, and are run by competent actuaries who agree 6.5% is the appropriate amount of taxes required to fund future benefits. If we reduce that 6.5% to 4.5% without reducing future benefits, it’s going to cause a shortfall in the funds available to pay those future benefits. After a two year payroll tax holiday, the average 27-year-old working family will have paid $4,000 less into the Social Security and Medicare trust fund. When the family retires in 40 years, that $4,000 holiday results in a $28,000 hole in the pot of money available to fund their future Social Security and Medicare benefits. Since Social Security and Medicare are defined benefit plans, that $28,000 will need to come from somewhere. Future generations will pay for our temporary tax holiday in the form of higher taxes. It’s bad enough to get stuck with a dinner bill when you go out to eat with your parents or grandparents. How would you feel getting stuck with a $28,000 bill because your parents demanded an extra $40 in each paycheck for two years? Could you imagine placing that burden on your children and grandchildren? What will you say when your children and grandchildren ask you why the $40 was so important back in 2012? The buffoonery and misdirection on display in a recent Washington Post column by Matt Miller is like nothing we’ve ever seen before. We’re firm believers that everyone has the right to their own opinion, but that doesn’t give them the right to deliberately mislead their readers with a ludicrous interpretation of facts. We recently attempted to put the entire Payroll Tax issue in its proper perspective, and Miller’s piece does the exact opposite by trying to claim that the poor are subsidizing Social Security and Medicare for the wealthy. This is quite possibly the most asinine comment we’ve ever read in a major newspaper. It is possible that a single dollar bill originally collected from the payroll taxes of someone making $35,000 was then sent out in Social Security benefits to a senior who earns more than $100,000. Therefore, we can’t say that Miller’s “fact” is 100% incorrect, but we can say with certainty that it’s 100% misleading and intellectually bankrupt. This is laughable on many levels. First, we agree with the premise that subsidies are bad, but to suggest that only “red” states receive subsidies is farcical. In fact, two of the top six oil producing states are “blue” states won by Obama in 2008, including California at #3 which has more electoral college votes (55) than the other four “red” states combined (47). Additionally, three of the top four states receiving farm subsidies were “blue” states (Iowa, Illinois, Minnesota account for over 20% of total farm subsidies). Solyndra and its green-subsidized brethren are almost exclusively located in California. Amtrak, subsidized by hundreds of billions of taxpayer dollars over the last 40 years, primarily services the NE corridor which is as “blue” as “blue” can get. We could go on, but we’ve made our point. Lastly, even if we believe the fantasy that only “red” states received subsidies, the “benefits” of the subsidy reach everyone, not just those in the “red” states. The effect of subsidies – particularly farming and oil subsidies - is to ensure increased competition with foreign producers, thereby increasing supply and lowering prices for consumers, not to line the pockets of the producers. Therefore, the high-population “blue” states, which, as far as we can tell, still eat food and drive cars, will benefit from these subsidies just as much as the low-population “red” states – perhaps even more. The secondary points in the column start to resemble intelligent thought, as Miller cites the problems with the mortgage-interest deduction (albeit with a ridiculous example involving Bill Gates) and the differences in Medicare costs by location that go above and beyond the cost-of-business differences of each location. We have no problem with major media outlets publishing partisan columns on the opinion pages, but it’s incumbent upon those media outlets, both left and right leaning, to ensure those opinions are based on a complete set of relevant facts, not on incomplete and intellectually dishonest statements masquerading as facts. Two quick points on an incredible piece on CNN.com summarizing Attorney General Eric Holder's testimony in front of Congress regarding the "Fast and Furious" scandal. Our first point relates to Mr. Holder's attempt to deflect any criticism about his role in the "Fast and Furious" scandal by trying to "turn the tables on his GOP critics, accusing them of engaging in 'inflammatory and inappropriate rhetoric ... in an effort to score political points.'" Mr. Holder goes on to say it's time to end "politically motivated 'gotcha' games." Reporting on a $16 muffin to prove wasteful spending, or bringing up settled sexual harassment claims from 10 years ago to discredit a potential presidential candidate are "politically motivated 'gotcha' games." Vigorously questioning the Attorney General over a program conducted under his watch that intentionally provided violent Mexican criminals with weapons, lost track of those weapons, then found them at a crime scene where a US agent was murdered, is not a "politically motivated 'gotcha' game." Transcendent Speech or Regurgitated Populist Hyperbole? Yesterday, President Obama felt the need to fly half way across the country to Osawatomie, Kansas just to regurgitate all of his populist and hyperbolic campaign rhetoric into one heavily marketed and promoted speech. We couldn’t listen to it in real time because we have a job and were busy working, but lucky for us the White House tweeted about it as if it was the second coming of Martin Luther King Jr.’s "I Have a Dream" speech. Here at the antipopulist.com, we’ve already debunked many of the populist themes recycled in President Obama's speech, so we though we’d provide you with many of the official White House Twitter feed highlights, followed by our thoughts and links to previous pieces of relevance. Enjoy! We’ve debunked the premise that Republican’s are somehow putting the interest of their party over the interest of the country. We’ve also debunked the idea that the “rich” are not paying their fair share. Yet these simple truths are lost on the President and Democrats in Congress. A cynic might say they fully understand the faulty logic of these arguments, but can’t resist the lazy political lay-up that class warfare provides leading up to the 2012 elections. Mark us down as cynical. Before today, Occupy Wall Street was a "movement" involving a vocal minority who claimed to represent 99% of Americans, yet could only convince a couple hundred of the 20 million people in the New York metropolitan area to camp out in Zuccotti Park. Before today, this vocal minority carried out their demonstrations with a minimal amount of physical disruption to the everyday lives of New Yorkers or those in other OWS locations (except for maybe that hotbed of banking and capitalism, Oakland). Before today, Wall Street was cordoned off to a five foot wide path for pedestrians causing delays and inconvenience, and those unfortunate enough to live by Zuccotti Park for the last two months had to endure never ending noise and stench. Before today, OWS stuck to Zuccotti Park to carry out their first amendment rights, and while you might be puzzled by their message or disgraced that they are trying to represent the 99%, you respected their right to protest. 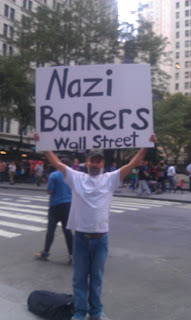 Before today, OWS was annoying, but not threatening or disruptive. Today, OWS has officially jumped the shark. Today, the OWS “movement” evolved from peaceful protest (for the most part), to a semi-violent, abusive and disruptive demonstration, infringing on the daily lives of anyone reporting for work in or around Wall Street (as well as other locations around the country). Whether you work for Goldman Sachs, JP Morgan, Duane Reade, Subway or the local shoe repair store, NYPD funneled you down streets lined with hostile OWS protesters hurling verbal attacks on everyone who walked by. New Yorkers are used to fighting crowds on the streets and in rush hour subways, but they typically aren’t yelling at you, and they certainly aren’t yelling at you for the sole reason that you work on or around Wall Street. The closest I’ve seen to this behavior is Yankee fans “welcoming” a Red Sox fan into the bleachers in Yankee Stadium. The Red Sox fan knew what he was getting himself into when he decided to wear a Pedro jersey into the bleachers in The Stadium, but the thousands of workers in and around Wall Street don’t deserve this treatment for simply earning a living near a certain street. Demonizing American’s who have spent their entire lives working hard to get an education and working hard to further their careers in order to provide a quality life for themselves and their families, is not only counterproductive to their “movement”, but is downright childish and ignorant. 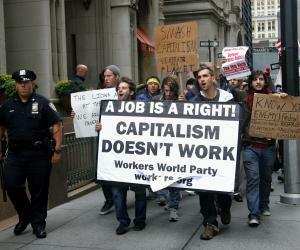 If OWS thought this behavior would advance their cause, they couldn’t have been more wrong. The figures above assume the 2011-12 season would generate the same revenue as 2010-11, a conservative assumption knowing that NBA revenues have grown in recent years. To date, the players have effectively spent $349 million to try and convince the owners to move the Players portion of BRI from 47% to 52.5%. As of yesterday, it looks like they’ve been successful in negotiating their way up to 50% BRI – a gain of $1,164,000 per game from 47% BRI. If the dispute was settled today and no further games were lost, the players will recoup their $349 million investment after 3.7 seasons. This of course ignores the fact that a dollar today is worth more than a dollar in three years. Given that the Players only want a three year deal, they’ve already “lost” and any further “investment” is really just throwing good money after bad. Hopefully the Players recognize this soon, hammer out a deal and get back on the court (sooner rather than later). If the season is lost in order to fight for 52.5% BRI (or other “structural” issues), the players will have spent approximately $2 billion dollars in compensation to “gain”, in the most unlikely best case scenario of 52.5% BRI, approx $4.5 million per game. Even with these most improbable gains, it would still take the Players five seasons to recoup the investment of a single lost season. Again, the five season best case scenario ignores the fact that a dollar today is worth much more than a dollar in 5 years. Additionally, the average career in the NBA is less than 5 years, so the average player will never recoup their investment. That’s the best case for the Players. If they lost a year and ended up back at 50%, it would take almost 20 years to recoup the investment, even longer if the owners were successful in reducing it below 50%. For some additional perspective on the demands made by the Players, let’s compare the BRI percentage demanded from NBA players to the compensation ratio received by the set of employees most well-known for “excessive” compensation – investment bankers. In what is arguably the most hated and reviled industry in the world right now, employee compensation during normal and prosperous times was typically set at or just below 50% of net trading revenues (effectively the same as BRI for investment banks). However, during the not-so-prosperous times, this ratio fell dramatically. As an example, the “poster child” for excessive compensation, Goldman Sachs, set its compensation ratio at 36% in 2008 and 2009 and 40% in 2010, after consistently setting it at 50% in years prior to 2008. So, in the midst of the Great Recession, the big, bad investment bankers received 35% of their employers revenue in compensation while NBA players received 57% of their employers revenue in compensation. Everyone is to blame for this mess, the Players for their incredible demands and the Owners for being poor businessmen and previously agreeing to those incredible demands. The solution is easy to see – agree to disagree, split the difference (i.e. 50% BRI), and get back on the court. Meanwhile, the non-millionaire employees of the NBA and its individual teams, and the thousands of small businesses that rely on the NBA, are jobless, waiting for Players and Owners to decided if the average NBA salary should be a paltry $5 million or an excessive $6 million. This debate is so focused on who’s going to win, and who’s to blame, that the easy solutions get ignored. Sound familiar? 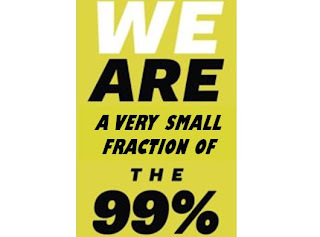 Open Letter to "Occupy Wall Street"
We respect your right to protest and "occupy" Lower Manhattan in an attempt to promote your agenda (or lack thereof), but please stop claiming to represent 99% of the population. You don't. Don't flatter yourselves. 2%, 10%, maybe even 25% in general terms, but certainly not 99%. We're quite sure you wouldn't want us representing you (see below), so please don't claim to represent us. We can, and will, represent ourselves. Thank you very much. P.S. Please clean up after yourselves and respect your neighbors. Hoping that the media wasn’t propping up a “movement” represented by this individual, we began reading up on “Occupy Wall Street” to see what it was all about. We’ve read the Occupy Wall Street website, right leaning opinions (and here) in the Wall Street Journal, left leaning opinions in the New York Times, and other opinions from outlets like CNN. Based on these accounts, Zuccotti Park in Lower Manhattan has turned into the world’s largest complaint box. 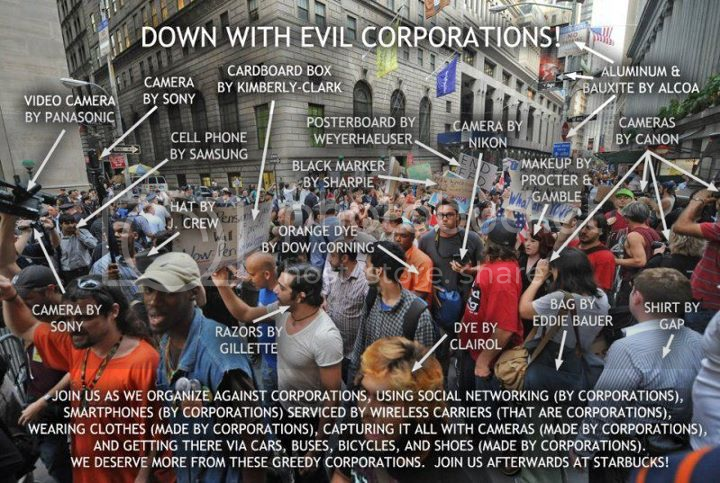 Occupy Wall Street is basically a giant sea of people complaining about anything and everything. Just like the complaint box you might find at your local McDonalds or Wal-Mart, Occupy Wall Street is a place to register complaints of all shapes, sizes and relevance. Some of the complaints are legitimate, however, the vast majority are based on incomplete or wholly inaccurate facts, are incredibly hypocritical, are mind-numbingly trivial, or are just downright loony and extreme. Not only are the complaints misplaced, but the complaint box itself is in the wrong place. You wouldn’t expect a complaint card about your cold Big Mac Extra Value Meal to change anything at McDonalds if you dropped it in the complaint box at the Starbucks down the street, would you? We suggest that anyone making these claims do some homework. All of the major “Wall Street” banks have already paid back their TARP bailout money (some of which they never wanted in the first place) in full, with interest, and in most cases, a lucrative kicker for the taxpayer relating to gains on warrants the banks were required to provide to the Treasury. In fact, not only will the Treasury get all its money back, it has estimated it will earn about $20 billion in profits from the bank portion of TARP. Seems like a pretty good deal for the taxpayer. We are by no means advocating for bailouts of failing institutions, but the TARP program was a necessary and hopefully one-time program that has proven its worth by avoiding a complete and total financial meltdown, while ultimately providing the taxpayer with a profit. Until such time that wide spread corruption or other illegal activities by large banks, “the rich,” oil companies, or any other Occupy Wall Street target have been proven, complaints focused solely on specific actors in the drama are misplaced. These complaints should be focused on the producer, director and writers of the drama - the elected representatives in your state house and in Washington D.C. The most relevant and legitimate complaint that the Occupy Wall Street movement makes is that the actors have become the de-facto producers, directors and writers due to their influence and power in Washington, bought and paid for through campaign contributions and slick lobbyists. However, this focus on the “1%’s” grip on Washington is ill-informed as for every Wall Street or Big Business contribution and lobbyist, there are even more from Big Labor and Trial Lawyers. It’s our elected members of Congress, with the approval of our elected President, who cast the votes that determine the laws and regulations of which every citizen and corporation must abide. This includes how much money the country raises through taxes and from whom, how much money the country borrows, how all that money is spent, and the rules and regulations under which every individual and business must operate. Last we checked, neither Goldman Sachs nor JPMorgan, or any other “Wall Street” bank or other “big corporation” has ever cast a vote on any legislation at any state assembly hall or in either chamber of the U.S. Capitol. The politicians we elect are ultimately responsible for the legislation, not those who try and influence them. If we don’t like our representatives so easily influenced, it’s up to us to remove those representatives and replace them with someone who will place the needs of the citizens above the needs of those with the resources to contribute and lobby effectively. We’re not giving Wall Street a pass on playing a part in the crisis, but they were far from the only actor in this hugely complex and intertwined drama. Everyone played their role - the banks, the mortgage brokers, the individuals who lied on their mortgage applications and/or signed contracts they couldn’t understand or afford, the pension funds and governments who had an insatiable demand for subprime mortgage backed bonds but couldn't be bothered to analyze them, the credit rating agencies for blindly slapping AAA ratings on those bonds, Freddie Mac, Fannie Mae, Federal Home Loan Bank, President Clinton, President Bush, President Obama, Congress (both D’s and R’s) and the Fed for actively promoting the real estate binge and everyone in-between. To lay the blame for our complex economic situation on 1% of the population is lazy and ignorant. Protests make everyone feel loved and important, but as the immortal James Brown once said, they’re “just talking loud and saying nothing.” Real progress and change is made at the ballot box. Only our elected representatives can change the game, in the meantime, criticizing those playing the game is a waste of time and resources, and is ultimately unhelpful in getting our economy, and therefore America, back on its feet. On Tuesday, students at UC Berkeley protested proposed legislation that would explicitly incorporate race and gender preferences into the university admissions process by holding a bake sale that explicitly incorporates race and gender preferences into the price charged for a cupcake. The group organizing the bake sale said on their Facebook page “Just like the CA Senate Bills 185 and 387 the phone bank supports, we will be considering race, gender, ethnicity, national/geographic origin and other relevant factors to ensure the equitable distribution of baked goods to our diverse student body." They must not teach satire or irony at Berkeley. To be clear, we’re not equating the historic struggle for racial and gender equality to the struggle of white dudes trying to get into Berkeley, but we are pointing out that CNN and others continue to focus on the headline grabbing aspects of a news event while completely ignoring the real substantive issues. The CNN article successfully establishes that everyone, including the organizer, agrees that the pricing at the bake sale is “inherently racist.” Crack reporting. What’s missing is any discussion of the real, substantive issue – whether, and how, race, gender and/or ethnicity should factor into university admissions. Quotes like these would add some much needed depth to the discussion and debate, moving it past the easy and predicable “racism” slant and more towards a nuanced and informative news article that addresses the substantive issues surrounding the debate. This is just one example of our media’s disturbing preference to focus on the headline grabbing aspects of a news story, even if it’s a secondary or even totally irrelevant aspect of that story. Another high profile example of this behavior was when Gov. Rick Perry called Social Security a “Ponzi Scheme” during a recent debate. The media spend more time debating whether Social Security met the Webster's Dictionary definition of a “Ponzi Scheme” than it did discussing the fundamental substance of the comment – i.e. Social Security is broken and needs to be fixed. It’s a disease that’s spreading quickly – the media and government continue to focus their limited attention spans on the sensational, yet relatively unimportant, issues of the day, while the important and substantive issues get ignored and continue to fester. Over and over again (including yesterday in his campaign stop in Detroit) we hear President Obama ask “if congressional Republicans will put country before party”, followed up swiftly as #countrybeforeparty in White House tweets. What exactly does President Obama mean by this? Is he suggesting that Republicans are purposefully making decisions that they know will harm the country? Does he really believe that before a vote, Congressman Joe Republican is sitting at his desk debating between a “yea” vote that is best for the country and a “nay” vote that is bad for the country but somehow best for his party? We’d urge the Obama administration to provide an example of a decision that hurt the country but served to advance the political party that made that decision. They can’t because it defies logic. The successes and failures of a political party are inextricably linked to the successes and failures of the country as a whole. President Obama only has to look back to the election results in 2010 for a perfect example of this relationship. A Democratic super-majority failed the country, and as a result, suffered huge electoral losses en route to losing control of the House. As the country goes, so goes the political party in charge. As difficult as it might be for President Obama and his fellow Democrats to accept (despite the glaring evidence of two and a half years of legislative and executive ineptitude), they don’t have all the answers. In reality, Joe Republican disagrees with Democrats simply because he doesn’t believe their approach will help the country. Joe Republican does not disagree with the Democrats just because he’s a Republican, he disagrees because he doesn’t believe in, or subscribe to, the specific ideals and principles encapsulated in the Democrats’ proposals. Suggesting that politicians, not to mention the country as a whole, blindly follow their President at the expense of standing up for their ideals and principles reeks of desperation with hints of dictatorship. This strain of thought, while perhaps a convenient excuse for an unsuccessful President, is neither reality nor democratic (note the lower case “d”). If anything, the passionate debate in Washington, while not very efficient in addressing our problems, is a sign that our democracy is alive and well. We have faith (perhaps naively) that the primary motivation for any politician, whether Republican, Democrat or Independent, is to govern in a way that best promotes a safe and prosperous country. Time will tell which party, or group of individuals (e.g. Independents), usher in growth and prosperity. However, we know for certain that whomever the public see as the usher will be in a position for huge gains in electoral influence. WASHINGTON - The Electoral College has voted and, as predicted by the general election results, no candidate received the 270 votes required to be elected as President of the United States. President Barack Obama received 213 votes, Governor Mitt Romney received 165 votes and Mayor Michael Bloomberg received 160 votes as every state adhered to their usual practice of voting in line with their state’s election results. Per the rules of the Twelfth Amendment of the Constitution, the election is now in the hands of the House of Representatives who, for the first time since 1825, will be required to choose the President. Each state’s delegation is permitted only one vote (no vote for the District of Columbia) and the candidate who receives 26 or more votes will become the President-elect. The House will continue voting until a candidate receives 26 votes. Despite receiving a plurality of the popular vote, it will be virtually impossible for President Obama to receive the 26 votes necessary to get re-elected given the large Republican majority in the House (33 state delegations have Republican majorities). While President Obama’s outlook is bleak, the outlook for the other two candidates is less clear. The ultimate result will depend on whether House Republicans decide to remain loyal to the Republican Party nominee or whether they will remain loyal to their constituents’ votes. If they remain loyal to the Republican Party, Governor Romney has a clear path to the White House; however, if the delegates remain loyal to their constituents’ votes, it will be a battle between Governor Romney supporters, Mayor Bloomberg supporters, and potentially even Democratic state delegates. The wild card in this voting process is the Democratic states, who, knowing that a vote for President Obama is a wasted vote, could vote for Mayor Bloomberg in an attempt to prevent the more conservative Governor Romney from reaching the Presidency. There will be urgency to this battle as the Twelfth Amendment requires that a President be selected before March 4th, the failure of which will result in the Vice President being named as President. The Vice President will be selected by the Senate following a similar procedure, except that all Senators are permitted to vote and only the candidates with the top two Electoral College votes are eligible. Therefore, only Vice President Joe Biden and Governor Nikki Haley are permitted on the ballot, and with a clear Democratic majority in the Senate, it’s almost certain that Vice President Biden will have 4 more years in One Observatory Circle. Both the House and the Senate have called sessions to hold the special elections tomorrow at 10am. Imagine the chaos this election result would produce? Cable TV could spontaneously combust at the mere possibility of this scenario. Democrats would be up in arms about losing another election after receiving the most votes and Republicans would be fuming about the entrance of a right-leaning independent into the race, poaching votes from their nominee, a la Ross Perot (even though they would likely win any House vote). This would solidify the viability of an independent or third party candidate in our way- too-polarized world of politics. The 2012 election is shaping up as the perfect venue for this to occur. Numerous Democrats are unhappy with President Obama, Governor Romney (or whoever wins the Republican primary) will be too far to the right for many moderate Republicans, and independents are itching for the chance to vote for a reasonable candidate who’s not beholden to the pure and strict Democratic or Republican views on life. Even if Mayor Bloomberg, Governor Huntsman, the Americans Elect nominee (by the way, we love this idea, but not sure it's ready for 2012) or any other viable moderate fails to win the general election outright, they will have set the stage for independents to confidently run as such in their local elections – whether it is for city councils, state legislatures, seats in Congress or future Presidential elections. The 2012 election could go down in the history books as the year independent candidates became relevant and took their rightful spot alongside the out-dated duopoly of the Democratic and Republican parties. We’re not even close to being affected by Mr. Buffett’s proposal, and are not opposed to increased tax revenue if done in a responsible and balanced manner, but it’s important to keep this issue in perspective. Higher taxes on 0.2% of the population is a lazy and populist political solution to a major and complex fiscal problem. As we’ve mentioned before, these taxes would have a limited impact on the deficit and only serve to distract from the real cuts and reforms required to reduce long-term deficits. The top income tax bracket has a rate of 35%. We’d like to understand how his employees have effective tax rates of 33% to 41% with an average of 36%. I’m sure there is a very good reason for this, likely resulting from Mr. Buffett’s convenient and incredibly misleading inclusion of payroll taxes paid by the employees and on behalf of the employees. Most of these taxes are only paid on the first $100,000 or so of income and are paid (in theory) to fund the future benefits of Social Security, Medicare, Unemployment Insurance, etc. No different than the insurance premiums that Mr. Buffett has built his fortune on. This cost results in an insignificant rounding error in Mr. Buffett’s effective tax rate, but has a larger impact on his staff’s (who presumably make significantly less than Mr. Buffett) effective tax rate. The comparison is very misleading because Mr. Buffett will receive the exact same Social Security, Medicare, Unemployment (HA!) benefits as his employees. Why should he pay more for the same benefit? Because he can? It’s the logical equivalent of charging Mr. Buffett $3,000 for a gallon of milk because he earned 1,000 times more than the average household. Mr. Buffett’s personal effective tax rate is not representative of the 0.2% of the population that made more than $1 million in 2008, nor is it representative of his 399 peers in the “super-rich” club. Based on this data, we estimate that those who made over $1 million paid an effective tax rate, as a group, of approximately 23%, and according to Mr. Buffett, his peers had an effective rate of roughly 22% (as compared to an effective rate of roughly 10% for the remaining 99.8% of taxpayers). Other than citing the capital gains and carried interest tax rate of 15%, Mr. Buffett does not explain why his effective tax rate is 25% less than his peers. It’s bad science and bad policy to rely on one man’s tax return to justify a change in the tax code that affects 245,107 or more people. Regarding the 15% capital gains tax, Mr. Buffett has repeatedly failed to address the interaction between capital gains taxes and corporate taxes. In theory, capital gains taxes are lower than the marginal rates because the investors economic gain has already been taxed (at least) once at the corporate level. Any distributions of those net gains (i.e. total gains less corporate tax paid) are taxed again in individual tax returns as capital gains. Using a very simplistic example, if the capital gains tax rate was 35% (same as corporate tax rate, and the highest individual rate), a $100 economic gain would result in an after tax benefit of $42.25 for the investor. $35 ($100 *35%) would be paid in corporate taxes, and $22.75 ($65*35%) would be paid in income tax. Therefore, the government will receive $57.75 for every $100 of economic gain generated by business activity. For the mathematically challenged, that’s a 57.75% tax rate on economic activity. This becomes infinitely more complicated due to the unwieldy US tax code, but the concept remains valid. Look to Europe to see the results of that level of taxation. Carried interest is a complex issue that we’re not qualified to comment on, but it’s an immaterial issue as it relates to the US debt problem. The antipopulist.com is full of CPA’s and we still can’t figure out all these various taxes, deductions, exclusions and special rates. This has nothing to do with Mr. Buffett’s op-ed, but it speaks volumes to the unnecessarily complex, voluminous, out-dated and special interest laden US tax code. Mr. Buffett identifies who should pay more, but does not suggest how much more they should pay. 10% more, 25% more, 50% more, 100% more? This seems like a very important aspect of the debate. For the record, the government could take every last cent from those making over $1 million dollars (i.e. a 100% effective tax rate), and ignoring the devastating impacts of that property grab on incomes and the economy, that tax revenue would still not cover the single year deficit projected for 2011. If he feels his tax contribution is too small, Mr. Buffett is free to write a check to the IRS. Mr. Buffett fails to mention the impact a higher tax rate would have on his charitable giving programs. He’s pledged to give huge amounts of his fortune to charity – wouldn’t a higher effective tax rate take money away from that fortune, and therefore away from his charities? I’d like to hear Mr. Buffett’s views on who will make more effective use of his fortune, the US government or his preferred charities. If Mr. Buffett wanted to provide $100 million to improve education, who would he want spending that money – Congress and the Department of Education or the Bill and Melinda Gates Foundation? Again, could Mr. Buffett afford to pay more in taxes? Absolutely. Would a sensible and reasonable increase in tax rates on those making over $1 million have devastating impacts on the economy? Probably not. Would that same increase make a noticeable dent in the budget crisis? No. Is it a political winner to scapegoat “millionaires and billionaires” while at the same time asking them to pay even more in taxes? Might be, but that’s why we’re here. Wow, the S&P downgrade has sent the panic in liberal Washington to incredible heights. They’ve resorted to the theory of throwing everyone up against the blame wall in the hopes that someone sticks. The Tea Party has now joined a wall that already includes George W. Bush (ad nauseum), S&P, fat cat Wall Street bankers, China, Big Corporations, private jet owners, “millionaires and billionaires”, Boeing and pretty much everyone except themselves and their campaign contributors. We do not identify ourselves as Tea Partiers. We’ve previously cautioned them to not overplay their hand during the debt ceiling debacle, for which they obliged, yet they are unjustifiably the scapegoat du jour for President Obama's administration. This is the ultimate cop-out in populist politics, shows an incredible lack of leadership and is revolting. The President wanted a clean debt ceiling increase, and has proposed a budget that increases spending to historic levels. The Tea Party opposed a debt ceiling increase, arguing that it’s too high already, and provided input into a Republican budget that significantly cuts spending in an effort to balance the budget. Congress and the President reached a compromise where the President received 100% of his debt ceiling increase, upfront, in exchange for some immaterial spending cuts over the next 10 years and the hopes of additional, yet still immaterial, cuts-to-be-named-later by another special committee that is doomed to fail. Despite the liberal outrage, it seems that President Obama worked out a pretty good deal. He got all of his requested debt limit increase, avoiding an election season showdown, only had to agree to immaterial cuts to discretionary spending, and washed his hands of any future cuts by deferring the tough decisions to a Congressional committee. This "compromise” avoided a “default” but, in the minds of S&P, was too weak to keep us in the AAA club. There is not a single rational reason why the Tea Party (which only recently has all of 15% of the total seats in Congress!) should get blamed for the downgrade, when they are the only party in town attempting to seriously fix the fiscal problems cited by S&P. Additionally, what exactly did the Tea Party gain from the debt ceiling debacle? A moral victory from achieving spending cuts that are completely immaterial to the overall budget? Another opportunity to suggest sensible cuts that will ultimately get ignored by Democrats and most Republicans because supporting those cuts might hurt their ever-important re-election campaign? Their biggest win was avoiding President Obama’s last-minute, Populist Politics 101, demand for tax increases on “millionaires and billionaires” (interestingly defined as those who make more than $250,000 a year, including small businesses) that wouldn’t have made a dent in our budget problems anyway, and in fact, could actually compound the problem. The President and Democrats were so intent on avoiding a “default” that they were happy to just kick the can down the road...again. Apparently S&P’s had enough with the can kicking and took the bold action of downgrading the US from a 0.0001% chance of default (AAA rating) to 0.001% chance of default (AA+ rating), turning a virtually meaningless downgrade into a political football. The President and Democrats quickly punted and immediately went on defense by aggressively pointing their fingers at the Tea Party and holding yet another press conference spouting out the same meaningless clichés and talking points. The American people want leadership in the face of our economic crisis, not blame games, condesending clichés about “shared sacrifice” and “compromise” or deferrals of important decisions to others. "Progressive partisans also displayed economic illiteracy, refusing to recognize the respectability or even the existence of alternative economic views." "How often they have haughtily lectured the nation on the vital importance of civility in public discourse, the urgency of constraining executive power under law, and the need for impartial expertise in public affairs to pragmatically weigh competing public-policy options. But in the debt-limit debate the virtues they profess could hardly have been more spectacularly absent." "Add to this the progressive belief that human beings can be perfected through the rule of experts, and you have a recipe—when the people make choices contrary to progressive dictates—for generating contempt among the experts for the people whose interests they claim to alone represent. And not just contempt, but even disgust at diversity of opinion, which from the progressive's perspective distracts the people from the policies demanded by impartial reason." This is an argument that we hear over and over again from the “tax the rich” crowd (President Obama, New York Times, Bill Maher, etc. ), but it’s an incredibly weak argument and fails the test of logic. For starters, it’s a stretch to say that the results “suggest” that Americans prefer a mix of spending and tax increases. It’s a flawed analysis of responses to an incomplete survey question. Does it surprise anyone that Americans prefer that someone else pay more taxes to reduce the deficit? It shouldn’t. I wonder what the results would be if we changed “Equally with spending cuts and tax increases” to “Equally with spending cuts and an increase in my taxes”? How many people would change their mind if it was their own money being used to reduce the deficit created in Washington, and not just "milionaire and billionaire" money? Simple analogies illustrate the flawed analysis. What if we polled everyone in line at the post office (where we know there will be a statistically significant sample) and asked them "who should pay for your postage?" The multiple choice question has two answers – “I should pay for my postage” and “Millionaires and billionaires should pay for my postage”. I guarantee the poll would “suggest” that Americans prefer that "millionaires and billionaires" pay for their postage. Would it then be logically sound to use those poll results as an argument for forcing "millionaires and billionaires" to pay for the postage charges of the rest of the populiation? How about a poll asking “Would you prefer to pay for pizza on Friday’s or have free pizza on Friday's?” Again, I guarantee that poll would “suggest” that we pass legislation requiring Free Pizza Friday’s across the country, because, hey, poll data suggests that Americans prefer free pizza. As we've mentioned before, we're not necessarily opposed to tax increases, but we'd prefer tax policy to be based on sound economic theory and evidence, not poorly constructed public opinion polls, which as we've shown above, will always "suggest" that someone else pick up the tab. The Tea Party Republicans are on the verge of making a Grand Mistake in the debt ceiling debate. It’s the same Grand Mistake of those they beat in the 2010 elections – they are overestimating their mandate. Tea Party candidates were voted into office primarily to bring fiscal sanity to Congress, not to enable a government default. As exaggerated a problem as a “default” has become (does anyone really care what S&P thinks anyway? ), it remains a significant political liability for Republicans (Tea Party members in particular) as the President and his cabinet would decide who gets paid and who doesn’t. President Obama has already made it clear that this will be purely political decisions (i.e. withholding Social Security checks, not paying the troops and veterans, etc.) rather than reasonable decisions in the face of a crisis. This result would certainly lead to major Tea Party and Republican losses in 2012 as the narrative will undoubtedly blame the Tea Party for not compromising and causing the default (an unfair, yet inevitable, narrative in our view – in reality, this crisis is 20 years in the making and everyone shares the blame). Change cannot happen overnight in a divided Washington. The greatest gift a Tea Party member of Congress could give their constituents would be an advancement of fiscal conservatism in a responsible and realistic manner. As voters come to appreciate the virtues of fiscal conservatism, this effort will pave the way for like-minded candidates to be successful in other districts/states, and will ultimately result in a greater influence of fiscal conservatism in Washington. Only patient and responsible governing can achieve that goal. Forcing a government shutdown or default might please your base and show that you can "walk the walk", but it will not advance your legislative goals, in fact, there’s a good chance it would kill them. Hopefully the Tea Party candidates will join their fellow Republicans and pass a bill that raises the debt ceiling in exchange for real cuts in spending in a way that is acceptable to the Senate and the President. It won’t be exactly what they want, but it's a move in the right direction, and most importantly, it will prove to the American people that the Tea Party is reasonable and can govern accordingly. Perhaps this is wishful thinking, but I guess we’ll see soon enough. Doesn’t this sound like the buffoonery in Washington over the last few months regarding the budget and debt ceiling debates? President Obama and the Democrats (i.e. the husband) are claiming to be the responsible adults in the conversation, despite having failed to pass a budget in over 2 years, even when they controlled Congress and the White House. Their preferred solution is to go out and get another credit card and figure out the rest later. And by later, I mean after the 2012 elections, because they know we’re in a pile of trouble and without a major rebound in the economy, some seriously hard and unpopular decisions will be required to avoid fiscal disaster. Despite their strong rhetoric, they know they can't just "tax-the-rich" their way out of the problem as there's just not enough revenue there to grab to make a significant impact. The Republicans have used the debt ceiling talks to take a stand and demand serious and immediate budget cuts (not as serious nor as immediate as we would like) in exchange for allowing a new credit card. The Democrats feigned compromise and produced illusory cuts over the next 10 years. For example, the Harry Reid plan would reduce the deficit by $1.8 trillion over 10 years (per CBO, and mainly by pulling out of Iraq and Afghanistan, which is optimistic at best). Both parties are guilty of scoring budget cuts off of projected spending over a 10 year period to make them look more impressive. The 2010 single year deficit was $1.3 trillion, and 2011’s is expected to be even higher, so we're not sure how any number below $5 trillion over 10 years realistically addresses the problem. When the Republicans called their bluff by refusing to raise the debt ceiling without more robust budget cuts (still not enough for us) and gimmicky future votes (e.g. a balanced budget amendment that has 0% chance of passing either the House or the Senate), Obama went on national television to again try and place the blame for the current deficit on Republicans while lecturing them from his ivory tower on the value of compromise. As if that wasn't enough, he threw a grenade into the negotiations by adding tax increases into the “compromise” at the last minute (no plan in Congress included tax increases). To his credit, President Obama has come out and proposed reasonable cuts to the budget, even putting previously untouchable entitlement programs on the table, but his good deeds are often overshadowed by his tendency to blame others for our problems (both Bush and his policies, or the "rich" and their tax cuts) - a trait that seems to be getting worse as his problems get bigger. Americans want a fix, they don’t want election year politicking to result in kicking the can down the road...again. Unfortunately, our leaders (on both sides of the aisle) are more concerned about their own jobs than America’s fiscal soundness. Since we loathe those who only complain about problems without suggesting a solution, here’s the antipopulist.com’s "compromise" that we're sure would equally anger both parties and would immediately disqualify us from public office, so we must be on the right track. Any debt limit increase must be offset by at least twice that amount in real and irrevocable spending cuts. We'd accept one for one cuts if it was required to avert a default, but when measuring these cuts, they must be compared to 2010 spending levels, not future budgeted levels of spending. No budget gimmicks, no soft cuts that will supposedly happen in 8 years time - real savings. Tax increases, while not preferred, would be acceptable if they are felt by everyone. These increases can be progressive (i.e. larger % increases for higher incomes), but it's important that all American’s feel the effects of government spending. We'd prefer a major simplification of the tax code – three income levels (starting at $0), three rates (starting at 5%), and a tax return that fits on a postcard. All current deductions/credits/allowances that only certain people can take advantage of would be gradually phased out of the tax code. We can’t have 50% of the country paying zero or negative income taxes and then voting for bigger government, while 2% of the country funds this unlimited expansion. If you want big government, you have to help pay for it, and feel the impact of higher taxes on your paycheck and on the economy (see Europe). Additionally, any tax increases must be offset by at least two times the amount raised with real and irrevocable spending cuts. Any actual cash surpluses (we can dream right?) generated by the above policies would be split evenly between tax refunds to all taxpayers and a trust fund for future fiscal emergencies. Any release of those funds would require a 3/4 majority vote from Congress and Presidential approval. All government programs are eligible for cuts, especially Social Security, Medicaid/Medicare, Obamacare and defense spending. The government must produce a balance sheet and income statement that is compliant with the same accounting standards as listed corporations, and audited as such. This does not need to replace the current government accounting rules, but it should be made available as supplemental information for taxpayers to see a more realistic view of government’s finances, it’s liabilities in particular. We have many more ideas, but the above would be a great start to the process of digging ourselves out of our financial hole. It’s embarrassing that we have a President who’s every word and action is intended to help him win an election that is 16 months away rather than addressing today’s problems head on. It’s also embarrassing that the various Republican candidates, when not making stupid mistakes, are only capable of running around and contradicting everything the President says like my 4-year-old might do to my 2-year-old. However, the fact remains that the 2012 campaign is in full swing, so it’s time for theantipopulist.com to put down its hope for the 2012 campaign. We’ll preface the piece by saying that there is approximately 0.03% chance that events will unfold as predicted below, but our hope remains audacious. This much we know for sure – President Obama will be uncontested for the Democratic nomination and will run a very efficient campaign filled with shots at the Republicans (current and past), and Progressivism 101 lectures on ideals that will supposedly “put the country back on track.” Ideals such as higher taxes on “the rich”, increased government spending, and heavy interference, I mean, regulation on all things evil (like banks, doctors, derivatives, cars, toys, speech - basically everything except government itself, lawyers and unions). The Republican side of the campaign is a circus of clowns driving around the country complaining about President Obama, shaking hands and kissing babies. Theantipopulist.com has no interest in debating the merits of Mitt Romney vs. Michelle Bachmann vs. Herman Cain, or any of the other candidates because they are all falling into the same trap that is sure to lead to defeat in 2012. It’s the trap of pandering to the far-right Republican base in order to secure the primary vote. We’ve discussed our hatred for the current primary system before, but in summary, candidates need to race as far to the right as possible in order to win the Republican primary. One starts with “I support the right to bear arms” the next adds “so do I, but I have two rifles” and the last says “oh yea, I hunt quail with my four semi-automatic rifles, three Glocks and an uzi!” This turns off moderate and independent voters - the same voters who decide general elections. General elections have always been a choice between lesser evils – a vote for who you hate the least. Our hope for 2012 is that this phenomenon is taken to the extreme. Sometimes the only way to get the pendulum back to the center is to push it as far out as possible. Think of the political parties of today as the subprime mortgages of 2006 – they are powerful, arrogant and everywhere, but their ever inflating bubble of influence is getting a bit too big, sure to pop at any second. To get that bubble of influence to pop in 2012, we hope the most batshit-crazy Republican wins the nomination. There’s no shortage of candidates to fill this role, but when the primary election only allows die-hard Republicans to vote, you’re destined to see a winner emerge who hates government, hates taxes, hates regulation, hates abortion, hates gay marriage, hates “elites”, hates foreigners, loves guns, loves religion, loves gas-guzzling pick-up trucks and loves to eat extra large value meals at McDonald’s three times a day as an expression of their American freedom. We’re being extreme with the stereotypes for effect – but the more polarizing the candidate, the better. Why would a totally batshit-crazy Republican nominee be a good thing? The combination of an ineffective incumbent President and a terrible Republican candidate would provide the perfect window of opportunity for a rational, reasonable and most importantly, moderate independent candidate to step into the race and have a very real chance of winning. If it’s going to happen, this person will be fiscally conservative with deep executive experience to combat the ineffective liberal tax and spend policies favored by Obama and the Democrats, but socially liberal - perhaps even to the left of President Obama public views (although almost certainly not his personal views). Throw in some foreign policy experience, or at least a reasonable world view, and you have the perfect candidate to single-handedly dismantle the two party political machine that has grown far too big and is no longer fit for purpose. Moderate Republicans, embarrassed by their nominated candidate and impressed with executive experience and fiscal conservatism, will vote for the independent. Moderate Democrats, unhappy with the economy and the advancement of social issues under Obama’s watch will vote for the independent. The final push will be provided by the crown jewel of the electorate, the independents, who will vote in droves for their dream candidate. Banks are “virtual casinos” and they “make most of their money” from trading, not lending. I can’t really blame Mr. Nocera for reporting the opinions of a CEO of a S&P 500 bank, who, in theory, should understand how Banks operate. However, I can blame him for not researching his argument and not asking the same questions of a more relevant bank CEO. Using the opinions of the M&T Bank CEO to prove your thesis about the largest Banks is the equivalent of theantipopulist.com making the Newspapers are Evil argument based on a single conversation with the editor-in-chief of The Sacramento Bee or The Roanoke Times. The average total assets of the top six bank holding companies referenced in the piece is $1.572 trillion. M&T Bank ranks 29th on this list with $68 billion, or roughly 4% of the average reported by the top six bank holding companies. The average daily circulation of the top six newspapers (which includes the New York Times) is just over 1 million. The Sacramento Bee ranks 29th on the list with circulation of 205,000 (20%) and the Roanoke Times ranks 99th with a daily circulation of 75,000 (7%). I didn’t have time to find a newspaper with a circulation that is 96% smaller than the average of the top six newspapers. Both Mr. Nocera and Mr. Wilmers make incredibly misinformed statements in attempt to show that Banks are gambling with our deposits. Mr. Nocera makes the statement that “the six largest holding companies, which made a combined $75 billion last year, had $56 billion in trading revenues.” Mr. Nocera clearly has never taken an accounting course, and must not be much of an investor if he confuses net profits with revenues. The $75 billion is net profits (i.e. revenues less expenses), the $56 billion is only the revenue – anyone who writes about business for a living should know that trying to compare a net profit figure to a revenue figure is a fool’s game. Let’s take the largest bank holding company, Bank of America, as an example of this foolishness. In 2010, Bank of America reported $10 billion in “trading account profit (losses).” That’s a lot of trading profit for one year. However, the relevance of these trading activities is quickly diminished when you look at the “Total Revenue, net of interest expense” which was $111 billion. Therefore, trading activities contributed less than 10% to the total revenues. This argument hinges on the statement by Mr. Wilmers that “if you assume, as I do, that trading revenues go straight to the bottom line, that means that trading, not lending, is how [Banks] make most of their money.” If I was an M&T Bank board member, I’d have serious concerns about Mr. Wilmers competence after a statement like this. Trading revenues do not go straight to the bottom line. Do trading revenues just appear from nowhere without any related expenses? Do all the traders generating these revenues work for free? Do they all work from home, without a phone, computer, network access, trading software, front office systems, back office systems, collateral management, financial controllers, risk officers, legal teams and others who support their efforts? Do the traders have access to free cash? What about taxes? Seriously, how could a CEO of a “large” bank make such a ridiculous statement? I could go on and on with concrete arguments proving why this would amount to throwing the baby out with the bath water, but instead I’ll just share another fact from the M&T Bank financial statements that proves my point. At the end of 2010, M&T Bank held derivatives worth $472 million, with notional amounts in excess of $15 billion. Additionally, almost 80% of these derivatives were classified as trading assets. If Mr. Wilmers really believes that derivatives have nothing to do with banking, I’d be curious why his company, which is “one of the most highly regarded regional bank holding companies,” holds $472 million worth of derivative assets (and $336 million in derivative liabilities). Bank executives do not set their own compensation; the markets do. You’re worth what someone is willing to pay you. The $20 million of compensation for JPMorgan’s CEO, Jamie Dimon, might sound excessive, but let’s compare his “value” to Mr. Wilmer’s using hard facts. It’s clear that Mr. Dimon received $18 million more in compensation, but when you look at the numbers relative to their banks performance, one could argue that Mr. Wilmer got paid twice that of Mr. Dimon. For every million of JPMorgan net income, Mr. Dimon got paid $1,352. For every million of M&T Bank net income, Mr. Wilmer got paid $2,717. Mr. Dimon’s compensation soaked up 0.08% of JPMorgan’s total compensation pool, while Mr. Wilmer share of M&T Bank’s total compensation was 0.2%, or almost two and a half times more than Mr. Dimon’s share. As a shareholder, which CEO is giving you the bigger bang for the buck? Based on the comments to Mr. Nocera’s op-ed, you would have thought he was the ultimate purveyor of truth and wisdom. However, his entire piece is built around the opinion of a single CEO whose chest thumping (at least through Mr. Nocera’s eyes and ears) isn't backed up by his actions as CEO or economic reality. Mr. Nocera is just another example of talking heads in the media - who for some reason people actually listen to and rely upon for information - developing a conclusion first, then searching for evidence to support that conclusion, with a reckless disregard for research and actual facts. It took 10 minutes to find the facts presented above, shouldn’t we expect a bit more effort from a New York Times columnist?